Maybe eventually I'll actually get my verse posted at the beginning of the month... such is life! My CBS bible study just started up again and I'm super excited. We are starting the year in the book of Daniel and that's where this month's verse came from-- Daniel 2:20-22. It jumped out at me especially because of the phrase "He changes times and seasons." Time and my use of time has been on my mind a lot lately, and with autumn officially beginning tomorrow (and our lack of a real summer) the changing of the seasons is something I've been thinking about as well. Add to that something my new core group leader said to me the other day, which really spoke to me: God is always working. It's just another reminder that His timing is different than my timing. He wasn't surprised when Brody appeared on the scene before we had our finances ready. It was no accident that we had such a strangely cool summer this year. He is in control of even the seasons, even the weather. I just love the way this verse drills into my heart the sovereignty of God. 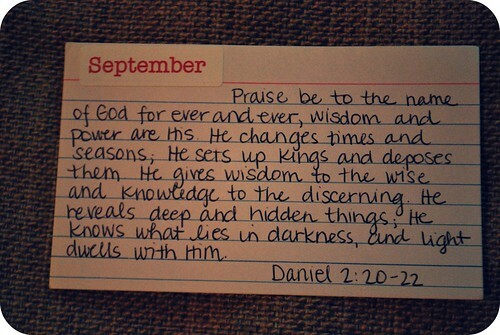 What's your verse for September?